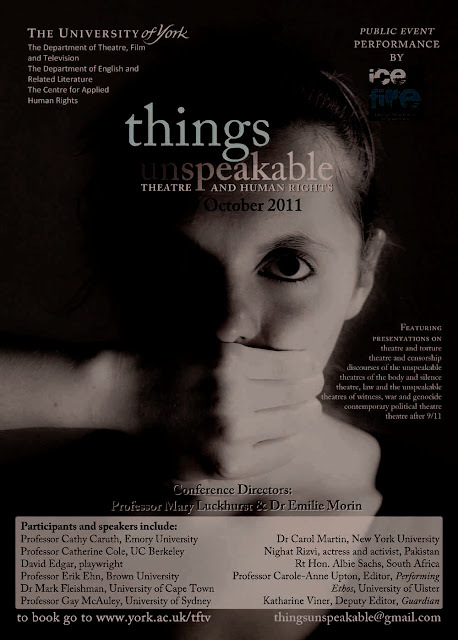 Registration is now open for ‘Things Unspeakable: Theatre after 1945’, an international, interdisciplinary conference on theatre and human rights at the University of York (7-9 October 2011). What have theatre and performance brought to our understanding of the unspeakable? 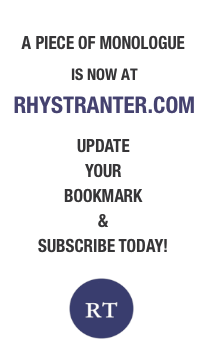 To what degree has the realm of the unspeakable gained new currency within established and emerging trends in theatre? What is the relation between enshrined understandings of the unspeakable and the resurgence of plays and performances about torture, war and genocide? This three-day conference gathers artistic practitioners and academic researchers engaged in the creation of new approaches to theatre, performance and human rights. The conference features 11 keynote speakers, a platform conversation between Albie Sachs and David Edgar on The Jail Diary of Albie Sachs, a performance of Asylum Monologues by theatre company Ice and Fire, and presentations on theatre and torture; theatre and censorship; discourses of the unspeakable; theatres of the body and silence; theatre, law and the unspeakable; theatres of witness, war and genocide; contemporary political theatre; theatre after 9/11. 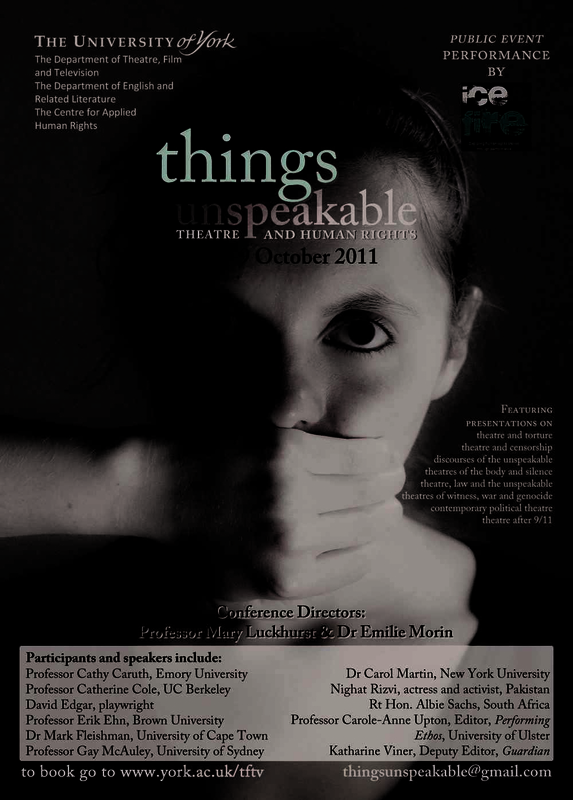 This conference addresses the terrain of the unspeakable in relation to theatre and performance. It invites reflection upon the idea of the unspeakable as it has been represented in the theatre, both in European and non-European contexts. In his 1947 memoir, L’Espèce Humaine (The Human Race), Robert Antelme pinpoints the ‘unimaginable’: the moment of confrontation between the concentration camp detainee and the liberator, the American soldier. In the wake of accounts from survivors of the concentration camps, the term ‘unspeakable’ has taken precedence in our collective imaginary when describing moments of unfathomable suffering. It has also informed renewed philosophical debate about history, representation and ethics. Philosophers such as Theodor Adorno and Sarah Kofman have reflected upon the singular tension, evoked by Antelme, between the unspeakable and systems of representation, and upon the horror that demands to be represented but cannot be. What particular issues of form and performance arise in relation to representations of the unspeakable in the theatre? What is the relation between enshrined understandings of the unspeakable and the resurgence of plays and performances about torture, war and genocide? To what degree has the realm of the unspeakable gained new currency within established and emerging trends in political theatre? To what degree have playwrights and other artistic practitioners drawn upon the vocabulary deployed in accounts of the Nazis’ Final Solution when reflecting upon war, genocide and the repetition of catastrophe?